It’s sometimes difficult for me to think up fresh healthy meal ideas when my store produce is looking so glum. That’s when I head to Southern California food blogs like Esi’s at Dishing Up Delights. She’s almost always cooking up something beautiful and green at any time of year. The only fresh item I bought for this soup, besides the spinach and holy trinity of carrot, celery, and onion, was some pathetic looking dill. I opened the little herb box when I got home and took a big whiff. A big whiff of nothing! Dill isn’t a winter herb in Northern Idaho obviously, and wherever it came from was much to far away for it to retain its vitality. The moral of the story for me is, don’t succumb to the temptation to purchase fresh herbs in January when dried ones work just fine. 2. In a bowl lightly all the ingredients with a fork or with your hands. Scoop with a cookie scoop and shape lightly with your hands into 1 to 1 ¼ inch balls. Place the balls on the cookie sheet. 3. Bake for 30 minutes, until cooked through and lightly browned. Set aside. 1. In the meantime, heat the olive oil over medium heat in a large heavy-bottomed soup pot. Add the onion, carrots, celery, red pepper flakes, onion powder, and garlic powder and sauté until softened, 5 to 6 minutes, stirring occasionally. 2. Add the wine and bring to a boil, reduce by half. Next, add the broth and water and bring back to a boil. Then add the pasta and cook for 9 minutes. 3. Add the dill and meatballs to the soup and simmer for 2 minutes. Add spinach and cook for 1 minute, until the spinach is just wilted. Then season with salt and pepper to taste. 4. Ladle into bowls and sprinkle with Parmesan cheese if desired. Adapted from Esi @ Dishing Up Delights & Ina Garten. Picture by Laura Flowers. I am having the last of the leftovers today which is a good thing because looking at your pic, I am craving this again! One of my absolute favorites... and you just gotta love Ancini di pepe. Oh how I love weddings! Even the soup variety. I need to make this soup. It's always been one of my favorites and your version sounds terrific. I don't think the dill would have been necessary anyway. One of my favorite soups all year! What a beautiful, comforting, yummy-looking bowl of soup. I love your photos, Laura. I love Wedding Soup! I remember my first taste was actually out of a Progresso can (don't judge me!) but now I love making my own. Laura, this is my oldest daughter's favorite soup. I'll have to make this for her our next visit. This looks wonderful. Italian Wedding Soup is one of my all-time favorites! This looks positively delicious! So comforting! Beautiful soup Laura, one of my favorites! I checked out the site you mentioned and loved it! What a great weekend recipe! This looks so great! I have seen Ina make this and have been dying to try it. Just came across your blog and love it... I'll be back! Now, this is a soup that will warm you and comfort you on a cold night. Mmm, must make a big pot of this. I've always been intrigued by the name of this soup! It just sounds so festive and about the herbs - I also use a lot of dried herbs, unless I can get the fresh ones from my garden... I never buy from the grocery! Yours looks lovely, and you've made me wish I HAD made it today. I empathize about the packaged "fresh" herbs we get at this time of year. Dismal in my region too. I suppose it makes us appreciate them all the more when they are in season, fresh and vibrant, yes?! First time visit to your site and I loved it. So beautifully presented. I shall be back soon. I've seen Ida Garten make this and always thought it looked good. And yours does, too. Maybe now that the chill has taken hold I'll give it a try. I can still brush snow off of some of my hardier herbs and use them. Dill, obviously is not one of them. Thanks Laura....I hope you and your mother are recovering well. Your version looks wonderful! 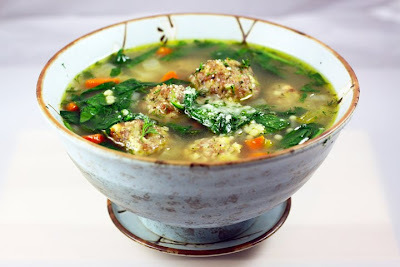 I just posted a Wedding Soup recipe of my own before I came across yours - seems to hit the spot with this cold weather! I think it turned out just fine for such a poor grocery shopping! Your soup looks delicious! Laura, I would love for you to use the dog pictures! Like I said though, I cannot take full credit. A friend sent them to me in an email and thought they were just precious. Hope you are getting good use out of them. I am trying this soup this week! Yum. congrats on the Foodbuzz news! Can't wait to meet you in February! That soup picture is divine! Can't wait to meet you in New York for the Foodbuzz Electrolux event! I love wedding soup and this looks fantastic! I tried making it from a cookbook but didn't turn out well. I will have to try your recipe! Looking forward to meeting you in NYC!!! Yay! Congrats on the Foodbuzz/Electrolux win. Can't wait to meet you in New York! CAKE! I was JUST talking to my friend about the same thing. I feel so uninspired when I go to the grocery store and it's the same 'ol thing over and over. I'm making this soup tonight! It's the perfect cold, windy and rainy day in Oregon for a warm delicious soup. Can't wait! In fact, I think I'll make it for lunch. So I made the soup and just boiled the meat balls in the broth, as suggested in a previous comment. It wasn't as pretty as yours because they we're the deep brown, but it still tasted fabulous and it was really quick. love it. thanks for the good food! It must be divine providence I clicked over to your blog, tonight. I've been so busy, I've neglected my reading. The long and short is: I've been looking for a good Italian Wedding Soup recipe for...ever? This one sounds perfect!! Thank you, Laura.